What does it mean if you wake up at the same time every night and don't feel good? The Chinese Organ or Body Clock, may be able to tell you what is going on with your body. In fact, the way our body is constructed is to contain an energy system of meridians, other than the known systems such as the lymphatic system, nervous system, etc. Those meridians are channels not unlike blood vessels, but with energy flowing through instead of blood. They affect the body and the substance exchange in it. The Chinese biological clock can show us the intervals in which energy circulates through the body, and the strongest energy levels in an area of the body every two hours. If there are problems in that particular area, the symptoms are noticeable. The yang meridians include the organs which exchange and excrete substances and energy: the colon, stomach, small intestine, bladder, duodenum and gallbladder. The Chinese medicine and law of rhythm rules say that the meridians work for 24 hours, divided in 12 two hour intervals. Each meridian has its peak when the opposite meridian hits its low. A Chinese doctor always asks his patient first about what time of the day the symptoms appeared. Knowing that, he understands where the problem originates, or rather where the energy circulates with issues, or there is too much energy. Its best to follow the biological clock and write down the time when the symptoms appeared. 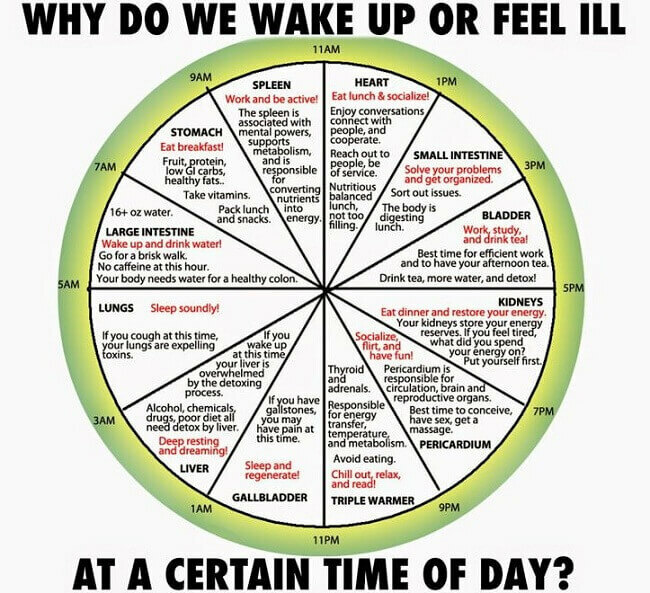 Also, note the time of day when you're most energetic, and when you wake up at night – that also implies there's an issue in a certain part of the body.